AEV’s Winch Mount is constructed from 1/4” steel and given an e-coat finish for industry leading durability. It tucks neatly between the frame rails and is compatible with our Premium Front Bumper and Tubeless Bumper. 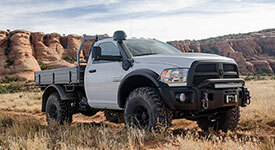 AEV recommends the WARN 9.5cti for their ease of installation and proven performance.